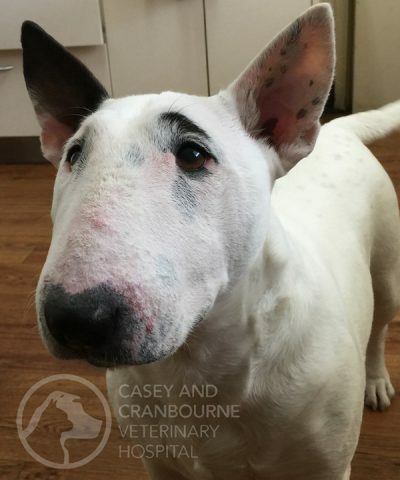 Meet April, a gorgeous, happy, healthy 5 year 9 month old female Bull Terrier. April was not so bouncy and happy when she was diagnosed with Addison’s Disease in April 2016. April first presented to the hospital with an acute onset of inappetance and vomiting whilst drinking more than usual but she was still bright and alert. These clinical signs can be seen with a large range of metabolic diseases or gastrointestinal issues. April continued vomiting despite an anti-emetic injection so she returned to the clinic the next day where abdominal X-rays were taken that ruled out an intestinal foreign body. Bloods were taken and April was placed on intravenous fluids. Her bloods showed a marked increase in kidney enzymes with BUN 45.5 (3.6-8.9), creatinine 217 (43-129) and phosphate 2.17 (0.87-2.1). She also had a low sodium level at 128 (138-158) and slightly high potassium level at 5.9 (3.8-5.8). The marked elevation in kidney enzymes could certainly have been due to primary kidney disease (kidney failure can cause vomiting and excessive drinking). 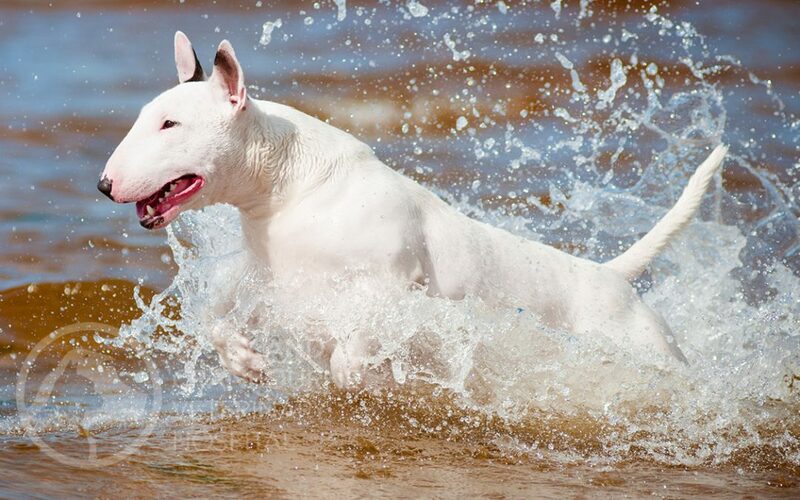 Bull terriers have an increased incidence of kidney disease but April had been screened for early kidney disease not long before this episode and she had a normal urine protein/creatinine ratio, ruling out early kidney disease at that time. There was also no known access to toxins such as ethylene glycol (antifreeze) or grapes or raisins that can cause acute kidney failure. The low sodium and slightly high potassium could have been a result of vomiting. Addison’s disease was also a possibility as it can cause a low sodium and high potassium (though usually much greater changes would be seen, resulting in the clinical signs of vomiting and inappetance). Addison’s disease can also cause an increase in kidney enzymes. April improved dramatically overnight whilst on the intravenous saline drip which made me suspicious enough of Addison’s disease to do the diagnostic blood test, an ACTH stimulation test. The blood result confirmed Addison’s disease. April was started on Florinef tablets (first line treatment used to control the fluctuations in electrolytes, most importantly, to stop the increase in potassium level in the blood). She was also given steroid tablets in case she crashed in what is known as an Addisonian crisis. What I have learnt about April over the past 18 months is that she does not do ‘normal’! Despite only having a marginally elevated potassium level and despite starting on the standard dose of Florinef, April decided to buck the trend and crash a week later with an Addisonian crisis. She was rushed to the clinic as she was weak, had muscle tremors and profuse vomiting. At this time her potassium had soared to 8.1 (in house range 3.5-5.8) and this very high potassium level resulted in an irregular heart rate with abnormal (ectopic) beats. Despite intravenous saline fluids and improvement in clinical signs, her potassium rose to a dangerously high 9.1 (3.5-5.8) before it started to fall. This Addisonian crisis prompted an increase in medication, with April requiring a double dose of Florinef plus daily steroid tablets. 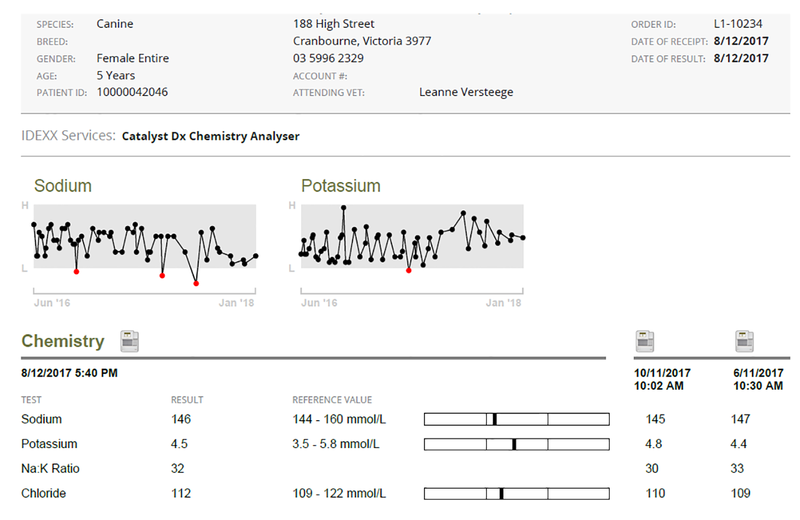 Over the course of the next 6 weeks, I performed weekly in house electrolyte blood tests as we tried to stabilise April’s potassium level. She seemed to finally respond to a dose of 2 + ½ florinef tablets twice a day, quite a high dose for a dog of her size but every time we tried to reduce her steroid dose, she became listless and lethargic, developed a picky appetite and had muscle tremors. Given the high doses of medication April required, it was clear this was not going to be sustainable long term. April’s owner, Nicole has been amazing and due to her dedication and diligence, we have embarked on a journey over the past 18 months following a protocol to control April’s Addison’s disease that is not commonly employed in Australia or indeed, elsewhere in the world. 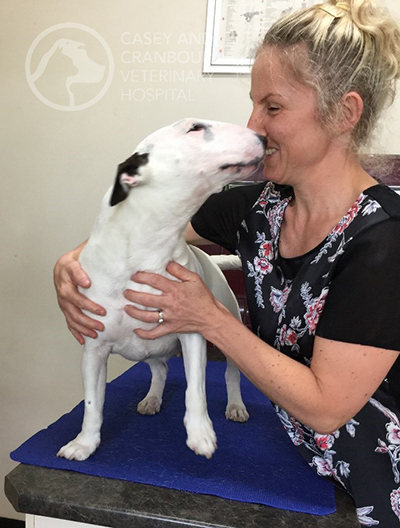 Nicole spent weeks researching alternative therapies for Addison’s disease and she came across a study undertaken by Dr Julia Bates in the United States who has trialled low dose Percorten-V therapy for Addison’s disease. Percorten-V (deoxycortone pivalate or DOCP) is a monthly injection used to control the mineralocorticoid deficit in dogs with primary adrenocortical insufficiency. I ordered in the drug Percorten-V and we started April on the low dose regime which meant she received half the dose recommended by the manufacturer. From June 2016 until June 2017, I measured April’s electrolyte levels every 2 weeks and she received a Percorten-V injection, every 28-35 days depending on her electrolyte level. Each time she has had a Percorten-V injection, I have managed to reduce the dose such that she is now on ¼ of the dose she started on (which is 1/8 of the recommended manufacturers dose). Her steroid dose has also been reduced to a really low level. By June 2017, I was happy that April’s Addison’s disease was controlled well enough to book her in to be speyed. The concern with Addison’s disease is that any stressful situation (including the stress of an anaesthetic and surgical procedure) can result in an Addisonian crisis. April required steroids to try to stop a crisis however steroids are not conducive to wound healing after major surgery so I had to keep this in mind. April sailed through her surgery and post op recovery and I was able to quickly reduce her steroid dose within a few days of her operation. Since June 2017, April has been really stable, I now only test her electrolytes once a month and I’m still finding I’m reducing her Percorten-V dose a fraction more each month. In summary, although Addison’s disease is not a common disease, it can appear like so many other diseases and illnesses with common clinical findings such as vomiting, inappetance, excessive drinking, weakness and lethargy. Hence why it is known as ‘The Great Pretender’. April has been a really interesting case study. She did not respond to a high dose of Florinef tablets yet she has responded really well to an incredibly low dose of Percorten-V. Had it not been for the research Nicole did regarding low dose Percorten-V protocol, I would have followed the manufacturers guidelines and started April on the recommended dose which in her case, MAY have caused more harm than good. The 18-month journey I have been on with April and her wonderful owner Nicole, tirelessly bringing April in every two weeks to measure her electrolytes, has been a fascinating one. This case study proves that Addison’s disease can be treated and managed successfully with long term medication and regular blood tests. With a diligent approach from both the owner and the Vet, dogs diagnosed with Addison’s disease can live long and healthy lives. Thanks to April and Nicole and the in-depth study we have undertaken, I am certainly confident now to adopt low dose Percorten-V protocol for any future cases of Addison’s disease diagnosed here at Casey and Cranbourne Veterinary Hospital.